Asthma Whistle is a reassuring relief for children affected by asthma. It’s an easy-to-use measuring device that syncs to an accompanying app, and can predict if an asthma attack is likely. Together with digiDoc, EGGS has helped with the development of this leading innovation in healthcare and medical technology by offering expertise in engineering, product design, prototyping and 3D printing. Asthma is a chronic lung disease that effects millions of people worldwide. An asthma attack can be a traumatic experience, especially for children, who often forget to take their medication. But now their condition can easily be managed by blowing into Asthma Whistle - a fun and educational device that helps track the results. Each time a child blows into Asthma Whistle the audio output is displayed and stored in an app, which then reveals the parameters of their lung functionality. This enables both parents and children to conveniently follow-up and manage asthma levels. 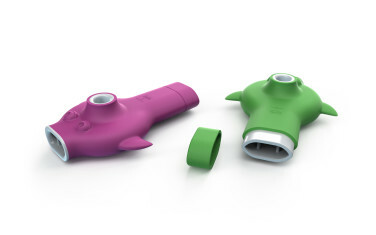 Asthma Whistle is designed to be an appealing device that’s practical and easy for children to use. Its playful visual appearance makes it non-stigmatising. The idea for Asthma Whistle was the brainchild of Damoun Nassehi, PHD, and his medical technology company digiDoc. 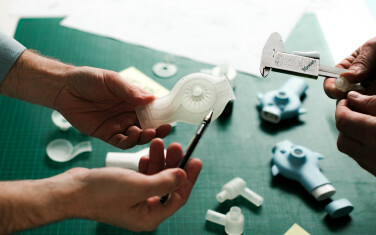 EGGS was involved from the start and contributed with engineering, product design, prototyping and 3D printing. This resulted in a far-superior upgrade from manually operated PEF (peak expiratory flow) meters, which are often impractical and don’t collect data. What Asthma Whistle offers is the latest in medical technology, to help people enjoy a better quality of life. Throughout the whole design and innovation process our EGGS product designers carried out extensive experimentation, engineering and prototyping with 3D printing, in addition to technology research, functionality and product design. The trick to getting children more engaged in medical technology is gamification. By applying game-design elements to Asthma Whistle, it not only encourages them to use it, but empowers them to learn at the same time. Having gained EU funding, Asthma Whistle is now being further developed by engineering and design agency MOEF in Denmark. So, the future looks bright for this essential little device. As an additional boost to 21st century healthcare, Asthma Whistle is certain to raise a greater awareness of asthma all round.